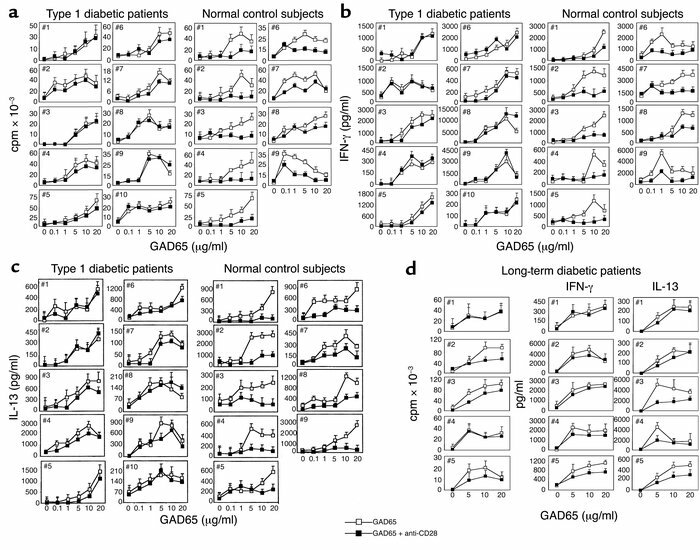 Response to GAD65 in individual type 1 diabetes patients and normal control subjects with blocking costimulatory signals. PBMCs from type 1 diabetes patients and normal control subjects were cultured with different concentrations of GAD65 (0.1–20 μg/ml) or TT (0.01–1 Lf/ml) in the presence or absence of anti-CD28 F(ab′) fragments. After 5 days of culture, rhIL-2 was added to each of ten replicates established for each antigen concentration with or without blocking Ab’s. After an additional 5–7 days of culture, supernatants were collected for cytokine detection, and proliferation was assessed by [3H]thymidine incorporation. (a) T cell proliferation in 19 separate experiments. Each symbol represents the mean thymidine uptake of ten replicate cultures ± SE, stimulated only with the antigen (open squares) or with antigen plus anti–CD28 F(ab′) fragment (filled squares). T cells from both patients and controls proliferated in response to GAD65, and blockade of CD28 costimulatory pathway inhibited GAD65 proliferation and (b and c) cytokine secretion in healthy subjects but not in patients with type 1 diabetes. A summary of all the new-onset patients and controls is shown in Figure 2. (d) Proliferation and cytokine secretion in five long-term diabetic patients.